The Audi RS 5 is a high performance version of Audi’s A5 and S5 coupes. The German luxury and performance auto manufacturer offers the RS 5 in coupe and convertible versions. The Audi RS 5 was introduced in 2010 and boasts Audi’s quattro permanent all-wheel-drive system, as well as high end touches such as a speed-activated rear spoiler in the trunk lid that automatically extends at 75 miles per hour and retracts at 50 miles per hour. Audi revealed the RS 5 at the Geneva Motor Show in 2010, and sales of the car began that spring. For the 2010 model year, the Audi RS 5 featured a 4.2-liter V8 FSI engine that is based on Audi’s 5.2-liter V10; just two cylinders were removed to create the new powerplant. The 4.2-liter drivetrain in the first year of the RS 5 yielded 444 horsepower and was paired to Audi’s seven-speed S-tronic transmission. The RS 5 had a weight distribution of 56.3 percent at the front and 43.7 percent in the back, and Audi designed two systems to help the car perform optimally and avoid understeer despite its heaviness at the nose. The electro-mechanic stability control system and the active rear differential work together to help the car balance its power and weight. The quattro all-wheel-drive system normally sends 60 percent of the engine’s torque to the back wheels, but based on driving conditions, that percentage can go as high as 85 to help the car’s handling. For 2010, the Audi RS 5 coupe also came standard with 19-inch alloy wheels, ventilated aluminum front disc brakes, aluminum eight-piston brake calipers accented with Audi’s RS logo, electronic stability with sport mode, Audi drive select with comfort, auto and dynamic modes, xenon headlamps featuring Audi’s characteristic LED daytime running lights, dual exhaust pipes, a speed-activated rear spoiler, power adjustable front seats with leather and Alcantara trim, vented brake ducts, a lap timer for track use, an oil temperature gauge, and carbon fiber interior trim. Buyers could select among several optional interior packages, such as seat upholstery and headliner options, dark stainless steel mesh or brushed aluminum interior trim inlays, and suede-trimmed controls. A carbon package was offered to accessorize the engine compartment and the car’s exterior. The Audi RS 5 coupe was updated for the 2012 model year, along with the rest of the A5-based vehicles. The front and back lights were updated and the front bumper was revised. The suspension received upgraded damper and spring components, as well as a new electric power steering system. Then Audi added the RS 5 Cabriolet convertible version to the lineup, with an unveiling at the 2012 Paris Motor Show. Sales of the RS 5 Cabriolet began in Germany in early 2013 and deliveries began in the United States that spring. 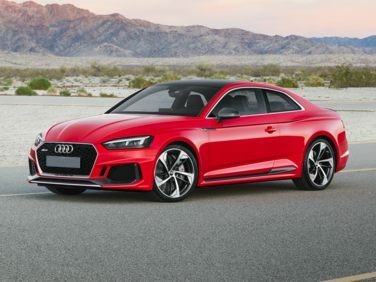 The 2013 models of the Audi RS 5 Coupe and the RS 5 Cabriolet feature the same drivetrain as the 2010 model, the 444-horsepower 4.2-liter FSI unit and S-tronic sport automatic transmission. Both versions of the Audi RS 5 are equipped with the quattro all-wheel-drive system.